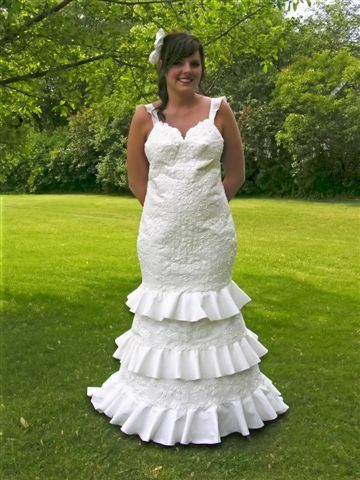 Sponsored by cheap-chic-weddings.com, the competition features some fabulous dresses made from the common toilet paper. I can’t believe these dresses were made out of paper. I would have loved to see all of the 564 entries after seeing these ones…WOW!! The winner was Katrina Chalifoux of Rockford, Illinois. Katrina spent over 2 weeks creating this wedding dress. It has a raised flower pattern made from molded toilet paper. To see the other winners visit http://www.cheap-chic-weddings.com/wedding-contest-2008.html.